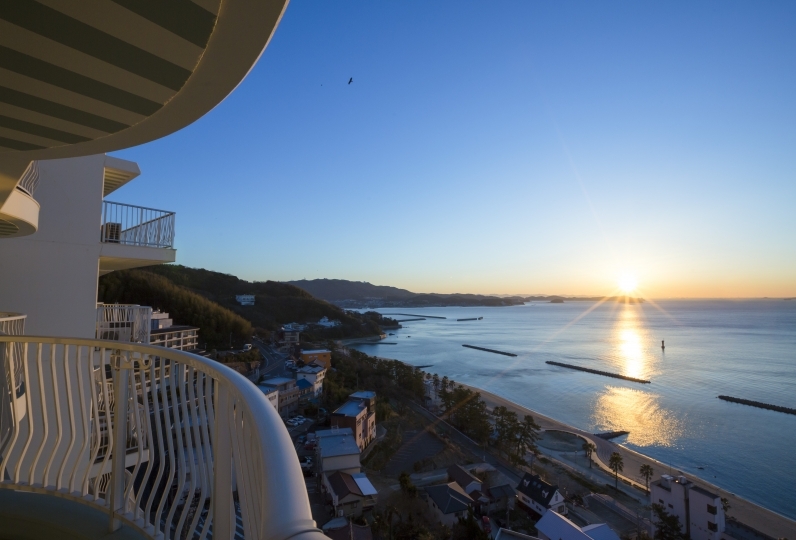 Where one can monopolize the sight of Mikawa Bay meeting the sea and spend their time however they like, the women-only inn Himeyado Hanakazashi was born. The rooms are a collaboration of Western room ease of use and Japanese room comfort for a modern Japanese style. All rooms, of course, have a luxurious ocean view. All rooms are angled to face the morning sun so that each guest may wake up in a pleasant manner. The bathers are two spacious public spas. 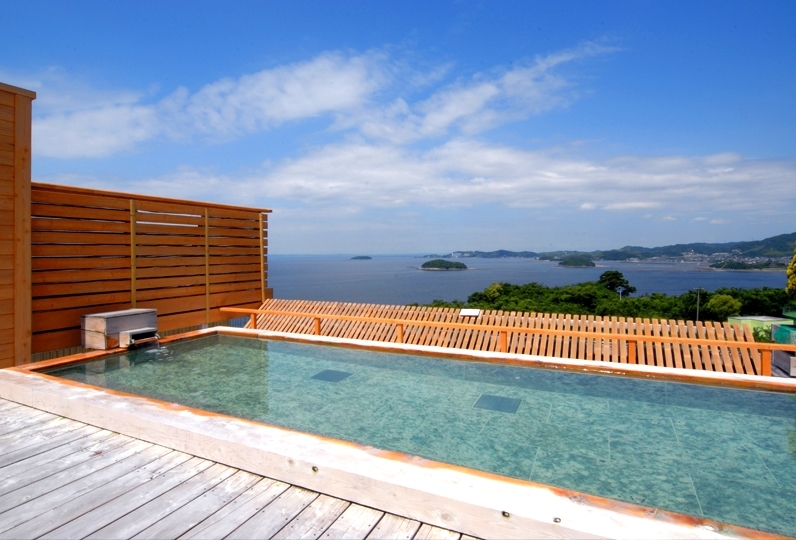 Both of them command a view of Mikawa Bay from their outdoor spas. Why not try having your body and mind soothed in the Fountain of Beauty natural hot springs? The main portion of dinner is the fresh bounty of Mikawa Bay and the local brand beef, "Mikawa-gyu". Incorporating a liberal amount of seasonal hand-picked local vegetables, our head chef prepares a specialty kaiseki course meal. Breakfast is comprised of a Japanese set meal that is easy on the body and a half-buffet of Japanese and Western food. Himeyado, where both Japanese and Western styles collaborate: Where you can relax and heal, both luxuriously and actively. Please be sure to enjoy a wonderful stay here if you are looking for a ladies only stay. We adopted "All inclusive" which allows you to stay relaxed without any trouble. 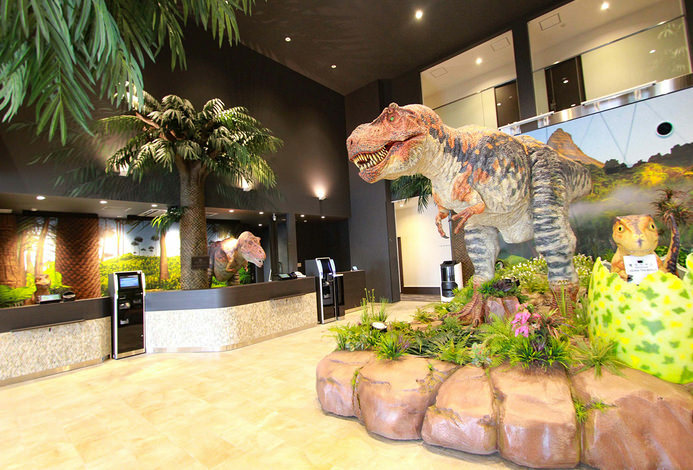 Services available in the hall are free, including drinks at the time of meal, drinks from the refrigerator in the room (no supplementary replacement), and use of night bars (20: 30 ~ 22: 30). You can also use the free tea stand "Himenjuku TEA STAND" (opening hours 15: 00 ~ 22: 00, 7: 30 ~ 10: 30), popular photography hall "Himeku photo gallery" (one pair 20 minutes). All the services were included in the accommodation fee and I was most pleased that I could fully enjoy it without worrying about the extra charge. Especially surprised is that not only the tea and coffee in the lounge, but also the drink at the bar at dinner is all you can drink including alcohol. The point which I became concerned was that a lot of hair fell on the bathroom in the large public bathroom, and there were two large public baths. To enter either it gotten up and entered from another entrance after climbing up and changing It was hard to understand without guide. We got a detailed care and we all had a pleasant time with everyone's attentive customer service. Also, it was a ryokan that I wanted to come. It was really safe and awesome for girls' journey. So I'm satisfied and want to go again! Gamagori 's famous hot spring "Beautiful Spring" is simple and alkaline and refreshing without any habit. Please enjoy the hot spring with refreshing mind and body. With over 30 kinds of tea leaves, you can be rest assured that there will be a variation of non-caffeine and low-caffeine tea for your late-night tea time. For coffee, beans may be ground to taste to enjoy a fresh cup of coffee (There is also an automatic coffee dispenser available). One can enjoy complimentary cocktails and mini hors d'oeuvres. Non-alcoholic cocktails are also offered in the full line-up. At Himeyado Photo Spot, one can choose a wedding or cocktail dress to try on and feel like Cinderella at a photo shoot. For guests who prefer Japanese traditional clothing, there is also a Kaguya-hime version of a traditional wedding robe in which to clad oneself. · This inn is a female-only inn. In addition, children under 12 years are not accepted. Please be aware. ※Special note： Meitetsu Gamagori line does not accept transportation IC cards such as suica or manaca.